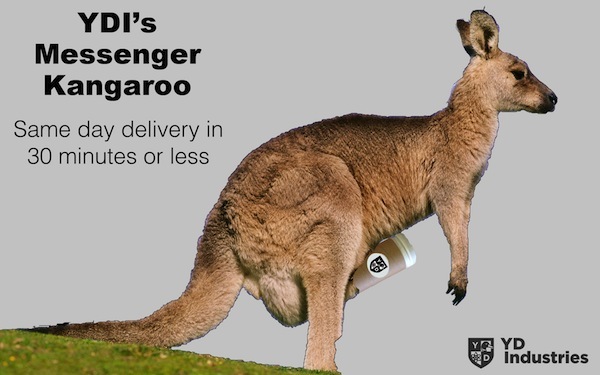 In the ultra-competitive world of consumer product delivery, YD Industries is once again charging ahead of the pack with an innovation that will revolutionize same day carriage across the globe: YDI Messenger Kangaroos! The YDI Messenger Kangaroo: Top flight delivery system for a new century. The goal of this innovative transportation system is to get packages in consumer’s hands faster than the average pizza order by leveraging the power of the kangaroo, the magnificent Australian marsupial. These specially bred and trained hopping mammals come with natural talents that trump all other currently conceived delivery methods. In a series of trials conducted by researchers at YD Industries next generation R&D lab, a squadron of the leaping beasts clearly outperformed drone helicopters, automobiles, and unruly, tattooed fixed gear cyclists in both the foul weather drop-off challenge and the Tough-Mudder obstacle course. The roos also proved adept at clearing hedgerows, thwarting burglary attempts, intimidating territorial canines, stashing payloads in pouches, and consistently surprising and delighting package recipients. YDI’s Messenger Kangaroos are best deployed in a star pattern. The YD Industries Messenger Kangaroo is best positioned en masse in a star formation radiating out from a product warehouse or control center. 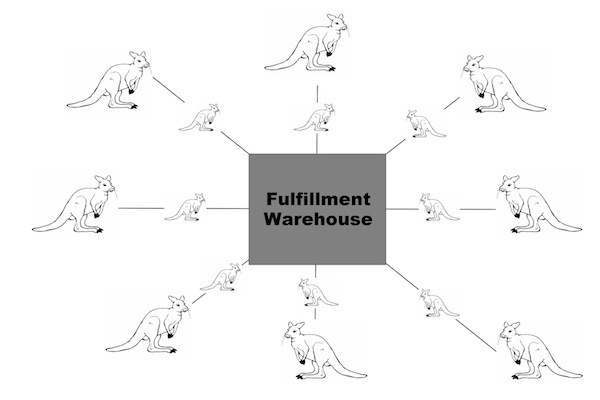 Packages are routed through the web in a “kangaroo express” style transaction, limiting the wear and tear on any one animal and ensuring even distribution of labor and nutritionally formulated energy kibbles. Returns are easily processed through a reversal of the delivery chain. Accurate navigation is ensured by GPS armbands affixed to each kangaroo, and location is consistently monitored by a mainframe computer connected to the world wide web. While the thought of a delivery kangaroo may seem like science fiction, it’s real. From an operational perspective, we’ll be ready to deploy our messenger animals as soon as the necessary state and federal regulations are in place. If you have a product or service that would benefit from the delivery talents of YD Industries Messenger Kangaroos, please contact Larry Mulgrew at YDI deployment and retrieval via the contact form. He’d be delighted to share additional information and detailed technical specifications. Manufacture Location: South Dakota, U.S.A.